Remember when I told you last month about my partnership with Walkers Shortbread cookies? 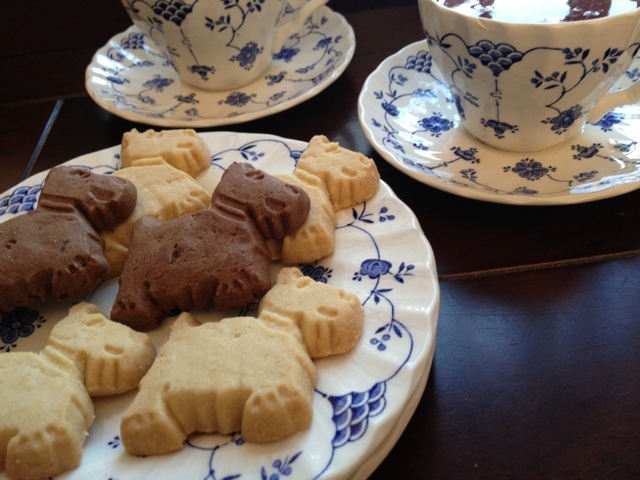 Well this month I’m excited to show you their newest shortbread item…..the Chocolate Scottie Dog Shortbread. This adorable cookie is a follow up to the very successful pure-butter Scottie Dog shaped shortbread cookie released in early 2012 and quickly became one of the top-selling items. It contains only one extra ingredient….can you guess? Geniune Belgian chocolate. Mmm….. I have to admit I was thrilled to get these scottie cookies in the mail because I had been seeing them pop up all over town….even Costco! Walkers Shortbread sent me both the chocolate and the pure-butter scottie shortbreads to try. I have to admit that I couldn’t wait to sample these cute shortbreads with my daily cup of tea. PERFECT!! Want to hear something else pretty perfect? Walkers sponsorship of the ASPCA….The American Society for the Prevention of Cruelty to Animals! Following a successful partnership with the ASPCA in 2012, through which Walkers raised over $31,000 for the ASPCA, the company has committed to a second year of partnership with the humane organization. In 2013, Walkers will make a minimum donation of $50,000 which will be funded by sales of Scottie Dog shortbread cookies. For every 3.9 ounce carton sold, 10 cents per sale will be donated…and the large sizes will donate 20 cents per unit sale. Isn’t that neat? 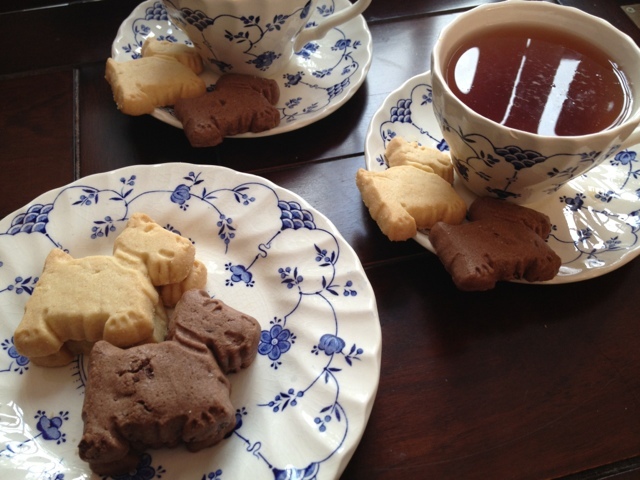 If you’ve never tried these scottie dog shortbread cookies, let me tell you….you’re missing out! They are quite delectable and went very well with my tea. I urge you to give them a try. The fact that you’re helping out animals when you purchase a box is quite a nice bonus. I’d like to remind you that Walkers contain no genetically modified ingredients, artificial colors, flavorings or preservatives. Would you like a chance to WIN a Scottie Dog Tin filled with scottie dog shortbread cookies? The kind folks at Walkers has offered one of my readers a vibrant, tartan tin filled with 18 Scottie Dog shortbread cookies. Just leave a comment below sharing with me whether you’ve heard of Walkers Shortbread, and if so….which is your favorite shortbread item? * Each action below results in 1 additional entry. 8 possible entries total. Like Creative Kitchen on Facebook. Leave a comment below stating such. Follow Creative Kitchen on Twitter. Leave a comment below stating such. Follow Creative Kitchen on Instagram. Leave a comment below stating such. Follow Creative Kitchen on Pinterest. Leave a comment below stating such. Subscribe to Creative Kitchen by RSS feed. Leave a commment below stating such. Like Walkers Shortbread on Facebook. Leave a comment below stating such. Follow Walkers Shortbread on Pinterest. Leave a comment below stating such. This giveaway will end at midnight Friday June 28, 2013. Reader will be notified by email & have 5 days to respond with mailing address before a new winner is chosen. 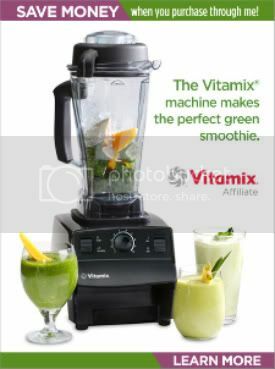 This giveaway is limited to U.S. residents only. Disclaimer: Though Walkers Shortbread sent me these cute shortbread cookies to sample, I did not receive any compensation for this post. All opinions are my own. If you enjoyed this post or recipe, please pass it along! There are many ways you can SHARE. One of the most popular options is to PIN it on Pinterest or to LIKE it on Facebook. It really makes my day! To make sure you don’t miss a post or recipe you can either follow Creative Kitchen on Facebook or Pinterest. Or subscribe by RSS subscription or Email in the sidebar. It’s FREE! Thanks for reading….I love having company in the kitchen! I like Creative Kitchen on Facebook. The cookies can be bought from the Walkers website that I linked to. I’ve also seen them at Costco. They sure are good! I’ve never heard of Walkers Shortbread until a couple of weeks ago. Can’t wait to try them out. I follow creative kitchen on twitter. I follow creative kitchen on instagram. I follow creative kitchen on Pinterest. I liked walkers on Facebook. I followed walkers on Pinterest. Yes,I have heard of Walker’s Shortbread, but just the squares in the red box. I’ve never seen these! I love that shortbread — but any kind is my favorite! I had these in the FBF swag bags! Holy buttery deliciousness! These were just squares, but really good! Oh yes, I have heard of Walker’s shortbread and my family loves this brand! We’ve only splurged on it a couple times, but it’s delicious. The only thing we’ve had are the plain shortbread bars. I would love to try their Scotties! I like Creative Kitchen on Facebook, as Pixel Berry Pie. I like Walker’s on Facebook too! I’m following you on Pinterest, as Pixel Berry Pie. I’m following Walker’s on Pinterest too! I’m following you on Twitter, as pixel_berry_pie. I have never heard of these before but would love to try them! Love them and eat them regularly. I have always loved walkers shortbread and love the scotties, I will look in Costco for them. Do you know where else they can be purchased, thank you so very much.